You have probably read ten different versions of the top ten reasons to buy organic food. But you haven’t read our list yet, and instead of telling you why you should buy organic we want to let you know five reasons why we choose to grow organically. 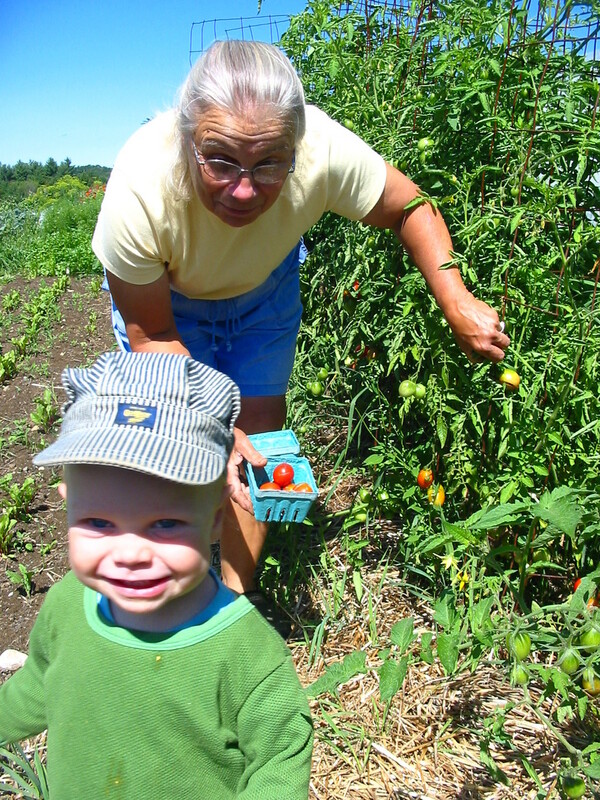 We grow all the vegetables, herbs, and flowers on our farm organically and are certified by Vermont Organic Farmers, a certification agency that ensures that organic producers are following the National Organic Standards. So why do we grow organically? We believe that growing organically is an obligation, not a choice. Growing organically means taking care of the soil, not just the crops, and utilizing ecological principals to produce strong plants that can resist pests and diseases. We intend for the land we farm and the water sources we utilize to be suitable for growing food long after our time on this planet is over. We don’t want to put on hazmat suits and respirators to apply chemicals to our crops for controlling plants diseases and insect pests. We don’t want our employees to have to do this either. By growing organically, toxic chemicals are not necessary to grow quality vegetables, herbs and flowers. We can suppress insect pests and plant diseases through crop rotation, timing of crop planting, physical barriers (such as row covers), and managing the soil for plant health such that the plants can fight off diseases and insect pests with their own natural defenses. To do this we have to learn about and pay attention to the needs of each crop, the needs of the soil, pest and disease life cycles, weather patterns and seasonal pest migrations. We need to test our soil for crop nutrient needs, monitor for pests, and plan our production such that if a pest or disease does damage a crop the farm’s production as a whole does not suffer. We want to eat fresh tasty vegetables right out of the field. Often I have heard a concerned parent say to their young child, who is about to pop a cherry tomato into her mouth, “wait, we need to wash that first”. Well, in our opinion eating a cherry tomato right off the plant is the best way to eat a cherry tomato. So by growing organically we don’t have to worry about pesticide residues on the plants, heavy metal build up in the soil, or raw manure contamination of crops. We do not use toxic pesticides, we do not apply fertilizers (such as sewage sludge) that can contain heavy metals, and we follow strict composting protocols and waiting periods for use of manure as a fertilizer in our fields. We eat vegetables all day long as we work, nibbling beans as we pick them, wiping the soil off a freshly pulled carrot and crunching away, getting a sugar hit from sweet cherry tomatoes warmed by the afternoon sun. We love watching the life, both the big and the nearly microscopic, that lives in and around our farm. Well, of course we don’t like watching the deer eat the lettuce, but the fox eating the vole, the snake eating the mouse, the toad eating the slug, the soldier beetle eating the potato beetle: these are all fascinating to observe, and more so these relationships are essential in our “agricultural ecosystem” to keep “pest” populations in balance. We’re cheap and don’t want to buy a lot of expensive fossil-fuel based chemicals to feed and protect our crops. That’s why we use cover crops! A cover crop is a grain and/or legume crop planted to cover soil when it is not being used to grow vegetables. Cover crops are essential in maintaining soil fertility and tilth, reducing weed pressure, and preventing soil erosion. They can be planted any time of year and harvested and/or tilled into the soil at different times depending on what our goal(s) is for the field. For example, we plant winter rye and vetch on many of our fields after we remove the last vegetable crop from the field in the fall. We allow the vetch and rye to grow on the fields through the winter into the next spring. Its fibrous root system helps to hold the soil together and prevent erosion and its growth is a way of storing any remaining nitrogen in the soil. In addition, vetch roots can actually “fix” nitrogen from the air in the soil into a useable form that plants can use. Rather than leaching out, nitrogen is stored in the tissue of the cover crop, and then when we till in the crop in the spring it’s just like adding truckloads of compost to the soil. Hence the other name for cover crops – green manure. As farmers our intent is to provide you with real, wholesome food to nourish your body and mind. Our aim is to share with you all we know about growing food and taking care of the land. We love to grow food for you; and we love to answer your questions if you want to venture into growing your own food. What is better than to be your own farmer! But of course, we don’t all have the land or time to grow all our own food and keep up with the many other aspects of life. Which is why having farmers in our community is so essential. Having locally grown food in our community is essential. Having fresh, nutritious, wholesome, real food to eat is essential. Plant a seed, know your farmers, know your food.